Will Bank of America Corp. Be Trading Higher or Lower by 2020? Bank of America is one of the more polarizing bank stocks in the market, with a wide range of opinions among analysts. Here's what two of our own analysts have to say. Bank of America (NYSE:BAC) has certainly come a long way since the financial crisis in terms of asset quality, capitalization, and a renewed focus on its core business. Despite this, shares still trade for below book value. 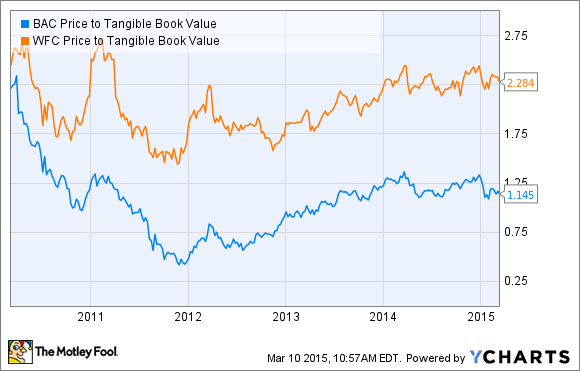 Where will Bank of America shares be in another five years? Will the share price be higher or lower than the current level, and will it outperform other bank stocks and the overall market? Here is what two of our analysts have to say about it. Matt Frankel: I think Bank of America will not only rise, but will outperform the market between now and 2020. However, this is a high risk/high reward stock, and investors need to approach it with that mentality. Since the financial crisis, Bank of America has done a great job of improving the quality of its assets, building capital levels, and simplifying its business. The bank is actively reducing its physical footprint to trim costs and run more efficiently, and it's getting better at cross-selling products to its existing customers (also a more efficient way of doing business). During the most recent quarter, for instance, the bank issued 1.2 million new credit cards, with two-thirds going to existing customers. As time continues to pass and the financial crisis recedes further into the distance, and as long as the bank continues to show that it can do a good job of managing risk and growing the core businesses (and avoids further legal issues), its valuation should improve relative to its peers. Bank of America currently trades for just 1.14 times the value of its tangible assets, which is cheap for a bank its size (Wells Fargo's P/TB is 2.28), and is partially due to the market's general distrust of the bank's risk management capabilities. Now, Wells Fargo certainly warrants a premium here, but I expect to see the gap close over time as the lingering effects of the crisis continue to fade. Finally, it's worth saying that a lot can happen between now and 2020 beyond the bank's control that could affect its stock price, including another recession. However, I think the most likely scenario is a continued U.S. recovery and growing profits for Bank of America. Dan Caplinger: I think Bank of America has plenty of capacity to climb higher from its current levels, but I don't believe it will be able to outperform most of its big-bank rivals. One thing that B of A has going for it is that investor expectations are relatively low. Price-to-book ratios are much lower than for most other big banks, as investors continue to question whether the value of assets on the books deserve their full value or whether ongoing discounts should apply. But Bank of America faces more potential problems than some of its peers as a result of anticipated changes in Federal Reserve capital requirements. One analyst recently noted that because of tighter requirements, Bank of America might not fare as well on this year's Fed stress tests as bullish investors hope. That could potentially push out the full restoration of the bank's dividend even further into the future, producing big disappointment and calling into question B of A's long-term plans to return more capital to shareholders. The bank has thus far not been able to raise its dividend back toward its precrisis levels, with its 1.2% yield lagging well behind healthier banks like Wells Fargo and JPMorgan Chase. In addition, Bank of America has already rebounded substantially from its financial-crisis lows. Even if CEO Brian Moynihan is able to make good on his promises to turn the long-ailing bank around and restore some of its lost reputation, new investors in Bank of America stock might not reap the full benefit of those gains. With all that uncertainty, Bank of America wouldn't be my first pick in the banking sector. Shares are likely to rise by 2020, but not as much as some of its peers among big banks.